Dynamite Entertainment proudly announces the March 2015 debut of Lady Rawhide/Lady Zorro #1, the first chapter of a four-part miniseries that will see two of the comic book industry's Western heroines cross paths for the first time. Written by Shannon Eric Denton and featuring interior artwork by Rey Villegas, Lady Rawhide / Lady Zorro #1 features cover artwork by acclaimed artist and Lady Rawhide co-creator, Mike Mayhew. Lady Zorro is a more recent addition to the Zorro mythos, created in 2012 as a strong supporting cast member of theZorro Rides Again series by Matt Wagner and John K Snyder III. Seeking vengeance after her husband was murdered by corrupt government officials, Lady Zorro cut a bloody swath across the countryside until the elder swordfighter calmed her rage. The character appeared in a successful 2014 self-titled series by Alex De Campi and Rey Villegas. "The folks here at Dynamite love two-fisted, gun-blazing, whip-cracking action, and that's exactly what Lady Rawhide/Lady Zorro delivers," says Nick Barrucci, CEO and Publisher. "With his flair for pulp action, Shannon is a perfect choice to take up the reins on the new miniseries. And there's no one better suited for bringing these two pistoleras together than Rey Villegas, whose supreme skill brought both characters to life in their respective solo series. Buckle up, comic fans - it's going to be a wild ride!" Lady Rawhide/Lady Zorro #1 will be solicited in Diamond Comic Distributors' January 2015 Previews catalog, the premiere source of merchandise for the comic book specialty market, and slated for release in March. 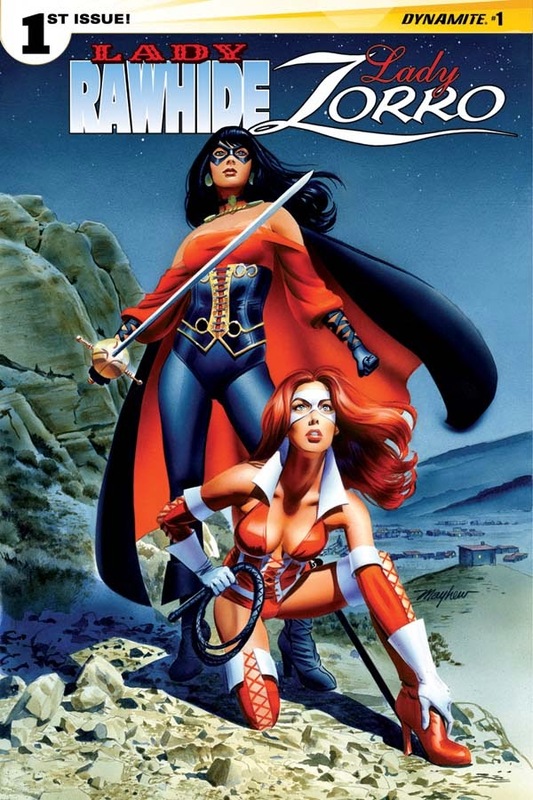 Comic book fans are encouraged to reserve copies of Lady Rawhide / Lady Zorro #1 with their local comic book retailers. Lady Rawhide/Lady Zorro will also be available for individual customer purchase through digital platforms courtesy of Comixology, Dynamite Digital, iVerse, and Dark Horse Digital.